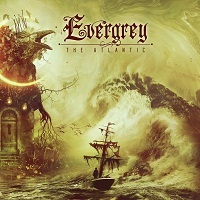 Review: "Evergrey: The Atlantic" - Sea of Tranquility - The Web Destination for Progressive Music! Anyone who thought that Tom Englund would get overly distracted by joining Redemption last year and forgetting about his main band Evergrey can rest easy...ain't gonna happen, and The Atlantic is proof positive. This brand new AFM Records release once again sees the vocalist/guitarist in fine form alongside the rest of his talented band, who include keyboard player Rikard Zander, guitarist Henrik Denhage, drummer Jonas Ekdahl, and bassist Johan Niemann. While not deviating much from the normal Evergrey style, The Atlantic features ten new songs dripping with the bands brand of moody, gothic, and melodic progressive & power metal music. With many of the tracks clocking in at over 6-minutes in length, the band are obviously going more for the 'prog' aspect here, and it's a welcome decision. Kick off number "A Silent Arc" is one of the best songs Englund has written in ages, a haunting but heavy track steeped in Zander's ethereal keys and plenty of guitar bombast, Tom's vocals just wonderfully catchy and instantly drawing you in. "Weightless" bubbles and boil, again packed with hooks, while "All I Have" is a dark and doomy prog-metal monster, the riffs leaden & mighty, the keys majestic, and the vocals anguished....classic Evergrey. The band ups the speed ante for the raging "A Secret Atlantis", piledriving drums saddled up next to crushing riffage and more of those trademark passionate vocals from Englund. Other standouts here include the massively heavy yet gorgeous "End of Silence", the monstrous, bass heavy "Currents", and the instantly memorable, hook laden "The Beacon", the latter another vehicle for Englund's amazing vocal talent as well as the guitar interplay between he and Denhage. Also, rather than close out the album on a more atmospheric and tranquil note, the band opt for a furious display of churning prog-metal with "This Ocean", drums blazing, keys & guitars battling, just a tremendous band performance to bring this release to a climax. Evergrey have long been one of the most unique sounding metal bands on the planet, and they continue on with yet another outstanding release here with The Atlantic. Also, if you pick up the CD digipack you'll be in for a treat as there's some excellent artwork adorning the release. Quality stuff all around!